As a proud Kickstarter contributor, I got these OVAs from Ankama months ago in my nice big pack of goodies. But I put off watching them until I could find a way to watch them in French with English subtitles, because the English voices don’t sit well with me after so long watching the originals – which is also why I STILL haven’t got around to finishing the new season of Mysterious Cities of Gold. But a few days ago Ankama E-mailed mentioning their trailer for season 3, and wanting to watch it but not wanting these three specials spoiled – which I now know they would have been had I watched – I decided it was time to figure it out. I was able to do so, and once again had the pleasure of dipping into le Monde des Douze. And what a pleasure it was. The specials were more than I had anticipated, continuing the adventures but building on them in dramatic form. We got to see a lot more familiar faces than I had expected, which was great for fanservice but also for the expansion of the world – not only Joris helped this time, but Kerubim and Atcham too (though I’m not sure when they took to calling Joris their father – maybe something the Dofus films will explain? I should probably watch Julith sometime soon!). Goultard appears too. More interesting still are the foes we see – most brilliantly, this OVA focuses on Ogrest and all the problems he causes the world. Great to see that story concluded after all this time. There is also Remington, Ush, the intriguing future threat Lady Echo, and intriguing mind-controlled cameos for comic characters Maskemane and Percimol. Nox is of course gone for good, but it was nice to see the references to him. These appearances were a lot of fun for a fan, but mostly it was just good to see the Brotherhood back in action, especially Yugo. What follows is an enjoyable quest with lots of scraps and two mightly power-ups for our main two heroes, but more crucially contains a whole lot of very sweet and engaging interactions between beloved characters. Whether Pinpin gets the power of a god matters to me far less than whether he is a good father, or if Adamai will come to understand his brother’s rash actions or the huge efforts he went to in order to preserve the World of Twelve. Personally, I loved this and regret that I didn’t watch it sooner. 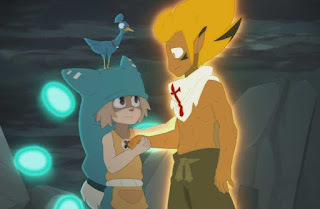 I’m a little sad it’s still so hard to get hold of and consume Wakfu materials, because it remains a firm favourite. What I’ll make of season 3 I’m not yet sure, but I’m confident I’ll enjoy it – and whatever else Ankama put out. It’s not that they can do no wrong, and I am a little worried that after Nox, the Shushus, the Eliotropes and Ogrest himself, the Siblings and perhaps the Gods themselves are going to seem a tad underwhelming. But I certainly haven’t had enough of Yugo, Pinpin, Amalia, Evangeline, Ruel and the rest...so I’m certainly on board for more and willing to see just how good Ankama’s follow-ups will be!